Water is perhaps the most common measurement made in the near-infrared (NIR). Water analysis is important as the presence of water can have a significant impact on the properties of a product, or on the reactivity of a reagent. In terms of practicality water is very easy to detect and analyze because it absorbs in the IR region very strongly when compared to organic molecules. Due to the strength of its absorption and its molecular simplicity it is possible to measure water content from a single wavelength, meaning a photometer (rather than a spectrometer) can be used for its analysis. 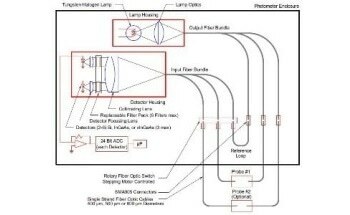 This article will cover choosing the right photometer, with the correct wavelengths and fiber optic probe that provides a suitable path length. All of these factors impact how sophisticated (and expensive) the photometer and probe need to be. 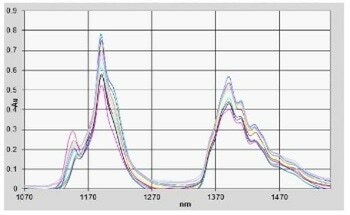 The 1900 nm region is generally used for <1% water; when using a ClearView® db photometer for this region precision of approximately ± 20 ppm is possible. For samples of more than 1% water measurements are usually taken in the 1400 nm region with a precision of approximately ± 100 ppm. 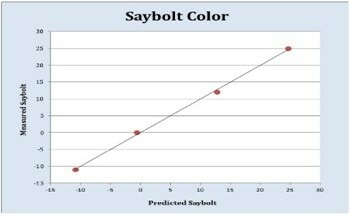 For process analyzers, precision is best defined by long-term (monthly) photometric drift. For the ClearVIew db this is usually less than 500 μAU. 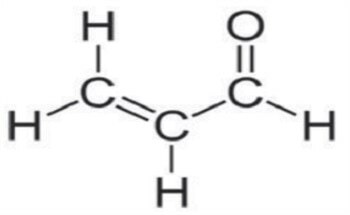 The stretch at 1400 nm is the first mode of the O-H bond present in water and hydroxyl groups, this is demonstrated in the above diagram for water and ethylene glycol. As both contain O-H bonds mixtures consisting of alcohols and waters have overlapping features around this region. 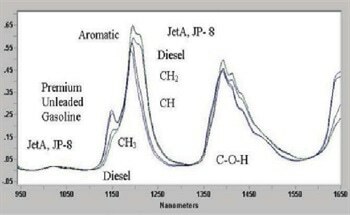 The two can be distinguished by the large peak near to 2100 nm in alcohols, which is a combination of O-H and C-H bond effects, or a unique water peak at 1900 nm, which is a combination of the H-O-H bend and O-H bond effects. It should be noted that at equivalent optical paths water is a far stronger absorber than ethylene glycol. This is made evident by the significantly weaker absorption observed at 1900 nm for pure glycol. Water’s absorption in the 1900 nm region is approximately five times larger than the peak at 1430 nm. 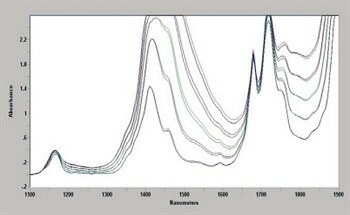 This means that for water in n-propanol with a 1 cm optical path an absorption of 1 mAU in the 1900 nm region corresponds to 20 ppm water, whereas in the 1430 nm region this would correspond to 90 ppm. For water in THF (tetrahydrofuran) or MIBK (methylisobutyl ketone) these values are 85 and 12 ppm/mAU respectively. 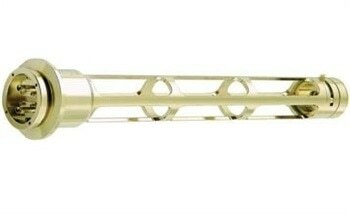 If the length of the optical path is doubled the precision is also doubled. Using a conservative drift of 3 s of 1.5 mAU and a 1 cm path length using the ClearView db the precision is ±125 ppm at 1430 nm and ±20 ppm at 1900 nm. The absorbance of liquid organics in the 1900 nm region varies significantly. CCl4 shows no absorbance in this region meaning long optical paths (10 – 20 cm) can be used to detect water at concentrations lower than 1 ppm. Many alcohols show absorption in this region, e.g. ethylene glycol absorbs 1.4 AU using a 1 cm optical path. 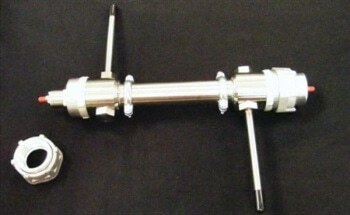 Using an optical path of 5 mm gives a baseline ethylene glycol absorption of 0.7 AU. As the absorption for water with a 5 mm pathlength is 24 ppm/mAU a water concentration of 1% would add approximately 0.4 AU to the 0.7 AY baseline giving a total absorption of 1.1 AU. This means that having a water concentration greater than 1% results in the 1.2 AU limit being exceeded so for higher water concentrations an even smaller pathlength is required. A photometer computes the absorbance between the water wavelength and a “reference” wavelength (= -log Water/Reference) and converts that into water concentration. The wavelength for the reference is selected in a ‘valley’ which shows only small changes in absorbance, e.g., 1300 nm. If any light scattering factors are present (bubbles, immiscible phases or particles) the whole spectrum can be tilted between the reference and the water wavelengths. As the water peak is being measured on a fine (mAU) scale the results can be easily tilted. The more significant the difference in wavelength the greater the effect of tilting (e.g., at 1900 nm). To account for this it is possible to choose a reference wavelength near to 1900 nm, but it remains important to filter particles out of the sample and maintain a constant temperature. The voltage from the detector at the reference wavelength (sent to the DCS at a 4-20 mA analog output) can be used to monitor the clarity of the sample. The highest point of the 1430 nm water peak is highlighted in Figure 2 in different spectra at temperatures ranging between 30 – 60 oC that intersect at 1430 nm. This demonstrates that different calibration curves are required for different temperatures. Research of percentage water concentrations has shown that when using the 1400 nm absorption a change in temperature of 1 oC can result in the calculated water concentration changing by 0.1% (1000 ppm). There are a variety of different ways of minimizing the impact that temperature has on the calculation. The wavelength at the point of spectral intersection or the piping in the side stream can be heat traced for calibration. A popular solution is to determine the sample temperature using a thermocouple (located near the probe) or an RTD sensor and to feed this information back to the ClearView® db photometer which can automatically calibrate for changes in temperature. Taking all of the factors above into consideration it is clear that Guided Wave can provide researchers with an effective and economical solution for water concentration analysis over the suitable concentration range for organic solutions.